Experience ground-shaking power and unbelievable speeds of the T-6 and Unlimited classes at the National Championship Air Races. 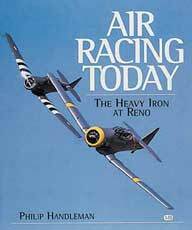 Book captures breathtaking action of the P-51s, Sea Furies, and other modified air racers with dramatic color photos and fast-paced text. Features daring pilots, devoted crews and intriguing racing aircraft. Includes section highlighting planes' decorative nose art. 112 pgs, SB, 9 x 10.5, 120 color photos.